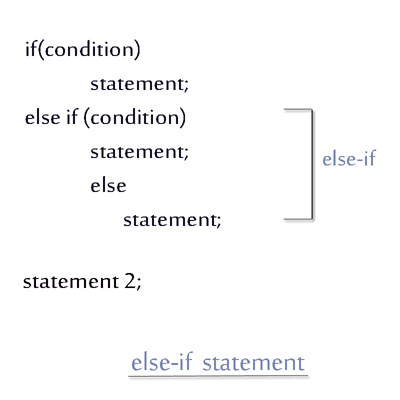 An if statement with its own condition. An else if statement with its condition. Finally, an else statement, which has no condition associated with it. First the condition in the parenthesis of if is evaluated for a boolean value - true or false. If the condition with if statement is true then the statement or a block of statements connected to it is executed. If the condition with if statement is false only then the condition associated with else if is evaluated. If the condition with else if statement is true only then the statement or a block of statements connected to it is executed. But, if the condition associated with else if is evaluated to be false then the statement or a block of statements connected to the underneath else is executed.